At Bespoke French Furniture you can have furniture finished in exactly the colour you wish! ANY colour, ANY fabric, ANY size! 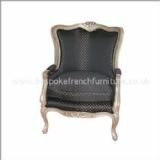 At Bespoke French Furniture our collections allow you to choose the finished paint colour and upholstery. 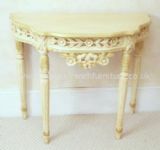 Choose beautiful custom made bespoke french furniture for your bedroom, living room, dining room, kitchen, study and bathroom from our collections which include beds, chairs, cabinets, sofas, mirrors, vanity units, desks, dressing tables and much more - all handmade and finished to your very own specific requirements so that you can be sure that they will complement the other pieces in your room. Many pieces have been inspired and influenced by classic French designs from the eras of Louis XV and XVI and include Rococo, Country Rattan and Versailles furniture. Choosing Bespoke French Furniture is the perfect solution when a collection is required in specific colours or a specific finish (such as antique or shabby chic) or when a piece is required to match an existing collection. Simply select furniture in your desired style and then contact us to discuss your finish and upholstery. Many pieces can also be modified to meet certain size constraints and we also offer a colour matching service - please contact us for details on 01473 358536. For the ultimate in luxury, we also have a Designer Furniture Collection with stunning pieces from Jetclass and Christopher Guy. For example, we can offer finishes in a variety of paint colours from Farrow & Ball, Dulux, Crown and others or you can choose your own combination in order to highlight certain areas. Popular colour choices include plain white, antique white, distressed white (shabby chic), plain cream, antique cream, distressed cream, antique gold, old gold, silver and noir (black) but many, many others are available including Gold and Silver Leaf. Or you may choose from a range of coloured polishes. The options are almost limitless so you really can have what you want! A specialist non-shiny lacquer is applied to the final coat which protects the finish and also makes the furniture incredibly easy to look after in the years to come. All bespoke painting and polishing is carried out within the UK assuring a finish of the highest quality. For upholstering we can offer you a wide choice of premium quality fabrics from our extensive range which includes satin, chenille, damask and many more in a huge choice of colours. We will supply you with fabric swatches to help you decide in the comfort of your own home and offer advice if required. Alternatively you may choose to supply your own fabric. All upholstering is carried out within the UK. All handles, knobs, locks on chests, writing desks etc can be changed to the style that you prefer. We can offer a vast selection to choose from or you may supply your own for us to fit. We can also change the legs and feet to the style you prefer. Our aim is to supply you with a premium piece of Bespoke French Furniture that has been individually finished in the UK to your very own personal requirements - quality custom made furniture that is truly unique to you. Should you not be able to find what you are looking for then please look at our Bespoke Design service where we can help you realise your very own design or have one of our products made to a specific size. Do contact us if you have any questions on 01473 358536 - we are here to help you.